(Torun, Poland.) – Wake up. Fence for 12 hours. Win six pool bouts. Win six direct elimination bouts. Win World title. Sleep for a few hours. Repeat. That has been the schedule for Team USA’s Lauren Scruggs (Ozone Park, N.Y.) for the past two days as the 16 year old followed her Junior (U20) World Championships win on Tuesday with a Cadet (U17) World Championship title on Wednesday. Scruggs is now the only U.S. foil fencer in history to have won both titles at the same World Championships and joins Olympic saber medalists Mariel Zagunis (Beaverton, Ore.) and Becca Ward (Washington, D.C.) as the only Americans ever to have accomplished the feat. Zagunis won the double in 2001 and went on to win Olympic gold in 2004 and 2008. Ward won Junior, Cadet and Senior titles in 2006 and earned Olympic bronze in 2008. While Yuka Ueno (JPN) won both titles in 2018, the last foil fencer to have done so prior to that was Aida Mohamed (HUN) who won Junior and Cadet gold in 1992 and earned four individual Senior World medals from 2002-2007. Returning to the pool rounds at 8:30 a.m. in Poland on Wednesday, Scruggs may have been tired, but she ground through six wins, giving up just four touches total to take the top seed out of pools. While she whipped through her first two direct elimination bouts with 15-7 and 15-3 wins over Isabela Sedlakova (RUS) and Sara Camacho (MEX), it would be her table of 16 bout that would cause the crowd at the Torun Arena to become the loudest of the week. 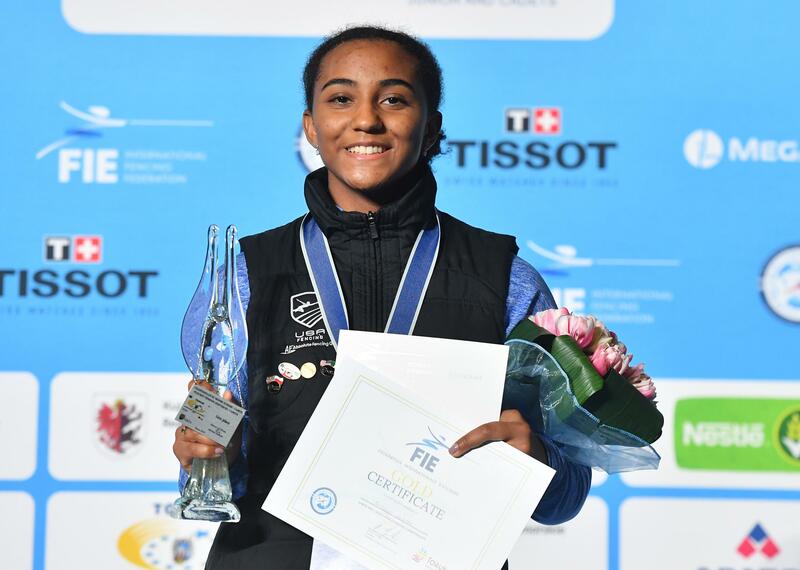 Scruggs took on Nicole Pustilnik – an up-and-coming 16 year old who previously represented the United States and won both Junior Olympic titles in February before making her World Championship debut for Israel this week. Pustilnik became one of the few fencers in Poland to truly challenge Scruggs this week and appeared to have nearly secured the win with a 14-9 lead in the third when Scruggs took the energy level of the building to 10 as she scored the first of the five touches she would need with 24 seconds on the clock. With 4.9 seconds remaining in the bout, Scruggs cut Pustilnik’s lead to one and then ran her opponent down the strip to score the tying touch with 0.03 seconds on the clock. The bout went into sudden-death overtime and Scruggs wasted no time, hitting Pustilnik off the line to take the win, 15-14, as her U.S. teammates roared for each action. “I’m someone who feeds off that energy, so to have them out there is just amazing. It means a lot to me,” Scruggs said. Fifteen-year-old Rhodes and 16-year-old Maia Weintraub (Philadelphia, Pa.) each had impressive Cadet World debuts, advancing to the top eight with Scruggs. With no coaches in the boxes and no cheering teammates as the Americans fenced each other, Scruggs built an 11-4 lead over Rhodes during the first period. Rhodes took five in the second, but couldn’t come back as Scruggs won the bout, 15-9 to secure a second podium finish in two days. The medal would be the third career individual World medal for Scruggs who also won bronze at the 2018 Junior Worlds. Within 30 minutes, Scruggs would be back on the finals strip, competing against Margherita Lorenzi (ITA) for a position in the finals. With the score tied at seven in the first, Scruggs reeled off three straight touches to end the period at 10-7. After the break, Scruggs scored the first two hits of the second period and controlled the remainder of the bout for a 15-9 win. Fencing Sein Hong (KOR) in the finals, Scruggs pulled away to a 9-6 lead after the first period and picked off touches one by one to end the bout, 15-9, to take the gold. Scruggs said her final bouts were good stylistic matchups against Lorenzi and Hong. With a junior title in the books, many athletes would feel pressure to repeat gold in cadet, but Scruggs said any thoughts in that regard were minimal. “A little bit. I was kind of was thinking, ‘oh, I got one. I’ll be satisfied with that,’ … Obviously I don’t want to lose a bout, but it wasn’t like, ‘oh I’m going to shamed’ or whatever,” she joked. On Thursday, Scruggs will aim to join Zagunis as the only U.S. fencer to win all three gold medals – cadet, junior and junior team – at the same World Championships. Scruggs’ cadet teammates, Rhodes and Weintraub, each earned top-eight results in their Cadet World debuts. Rhodes, who went 4-1 in pools, shut out her first opponent, Melike Tasdelen (TUR), 15-0, in the table of 64. Rhodes fenced a close bout against Qianqian Huang (CHN) in the next round, building an 8-7 lead at the break and staying ahead for a 15-13 win. Fencing Samantha Catantan (PHI) in the table of 16, Rhodes led the bout, 5-3, after the first period and outscored Catantan, 10-6, in the second for a 15-9 win before her loss to Scruggs in the quarters. Weintraub finished the pool rounds with a 4-2 record and defeated Michala Illekova (CZE), 15-7, in the 64. In the table of 32, Weintraub and Venissia Thepaut (FRA) felt each other out in the first period with the American scoring the only two touches in the first three minutes of the bout. Both athletes picked up the pace in the second as Weintraub went on a 6-2 run to take an 8-2 lead at the end of the period. Weintraub controlled the third as well for a 15-7 win. In the 16, Weintraub led her bout against Alina Poloziuk (UKR), 5-3, after the first period and closed at 15-9. Weintraub drew Hong, the eventual silver medalist, in the quarter-finals, but trailed 7-3 after the first break and 13-8 after the second before dropping the bout, 15-9. Three first-time team members competed in the cadet men’s foil event with 15-year-old James Chen (New York City, N.Y.) earning a top-16 finish. Seventeen-year-old James Liao (Basking Ridge, N.J.) and 14-year-old Chase Emmer (Morristown, N.J.) placed in the top 32. Chen went 5-0 in a short pool and earned a bye into the table of 64 where he defeated Jake McGillion-Moore (IRL), 15-6. In the 32, Minseo Kim (KOR) kept the bout close throughout with Chen holding an 8-6 lead at the break. In the second, Kim came within a touch of Chen at 14-13 before Chen closed the bout at 15-13. In the 16, Jie Xu (CHN) outscored Chen, 7-4, in the first and was nearly unstoppable in the second, taking the bout, 15-5. Liao went +23 with a 6-0 pool finish and defeated Luka Khattab (AUS), 15-6, in the 64 before losing to Cameron Evans (GBR), 15-14, in the 32. Emmer, who went 4-2 in the pools, defeated David Williams (GBR), 15-11, in the table of 128 and Che-Hao Yueh (TPE), 15-7, in the 64. He lost his next bout to Damiano Di Veroli (ITA), 15-12.